By: Nancy Blackmer, a registered dietitian at Advocate Sherman Hospital in Elgin, Ill.
An easy to prepare, delicious low-fat, appetizer. The bruschetta can also be used as a topping to grilled chicken or fish, too. Nancy enjoys adding avocado to her salads and sandwiches. Avocados are incredibly nutritious, containing heart healthy monosaturated fats and fiber, and as a result, can help lower cholesterol and triglyceride levels. They are delicious and easy to incorporate in your diet. Slice the French bread on a diagonal into ½” rounds and place on baking sheet. Toast in oven for 3 minutes, then flip each piece over and toast an additional 3 minutes. Remove from oven and immediately gently rub one side of each slice with garlic clove. Brush the tops of each slice of the garlic rubbed toasts lightly with olive oil. Set aside. 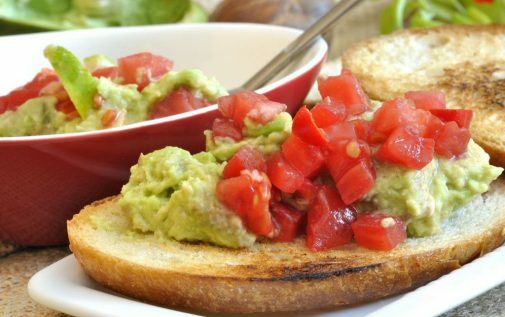 In a separate bowl, combine the chopped tomatoes, onion, avocado, lime juice, cilantro, salt and pepper. Mix together gently, making sure the avocado is well coated in the lime juice. When ready to serve, place a spoonful of bruschetta mixture on each piece of bread and serve.